Singapore has three great pleasures. Tonight we combined two of the three. Before the Christmas holiday, my colleague, Bharat, (the other guy from Singapore) suggested a night out during the slow week between Christmas and New Year (that is, the Western New Year. Here, we celebrate New Year twice, once Western style and once Chinese style). Part of the joy of going out is being able to look forward to it; we enjoyed that anticipation for over a week. 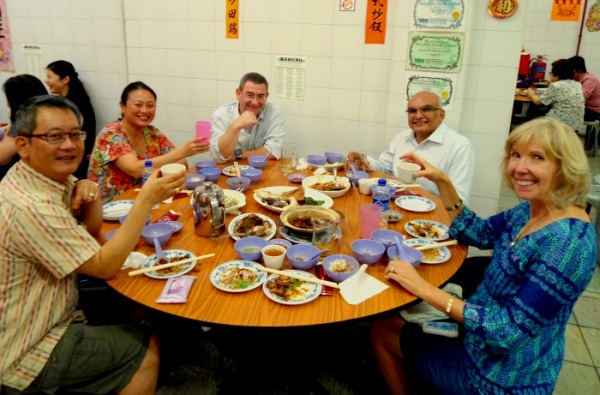 Singaporeans are justifiably proud of their city / country, and they delight in introducing their foreign friends to wonderful Singaporean food. Tonight was an excursion into Chinatown. Chinese dinner, ordered in conversation with the waitress without benefit of a menu. Rice, noodles, clay pot chicken, beef with bitter melon, steamed fish, prawns, Chinese spinach, sweet and sour pork. Tiger beer and Chinese tea (black, never green tea which would be Japanese). It’s important to have many people around the table because that justifies many dishes and many tastes. Good food, good conversation, many laughs. Brian, Pat, Paul, Bharat, Nancy, and Mike behind the camera as usual. The restaurant focused on the food, not the atmosphere. The walls were shiny white tile. The lights were bright. The rest rooms were – let’s say they were traditional. Not the kind of place that gets noticed in the Fodor’s or Frommer’s. Not the kind of place that the average Westerner would casually wander in and sit down. But the food was wonderful and the place had won awards (see the certificates on the wall above Bharat). After dinner, we went even deeper into Chinatown to a dessert shop. No chocolate ice cream or petit fours here. This was more serious Singapore Chinese eating. Mei Heong Yuen Dessert Shop, to be precise. Please order in Chinese, or just point to pictures on the menu. Walnut paste, which is warm, very slightly sweet, somewhat soupy, and vaguely walnut flavored. Chendol – coconut milk in shaved ice, red beans, and gelatinous green noodles; almost like ice cream. Mango, pomelo, and sago – chilled mixed fruit in a syrup. Good – maybe even very good – but not quite delicious to Western trained palates. Probably an acquired taste. Except chendol, which has left a delightful memory on my tongue. And, interestingly, everyone around the table described it to us as “very sweet”. Pleasantly so, but not what I would call overpowering. A thousand thanks to Brian and Bharat for giving us this introduction. A thousand thanks to Pat for introducing me earlier in the week to prata (originally from Southern India, and adopted as a Singapore staple – a flat, crepe-like pancake, often served with a bowl of curry and eaten for breakfast, accompanied by teh tarik, or warm, sweet, milk tea, Singapore style. Get it from the street restaurants). Good friends sharing delightful good food. How lucky we are to be here! I am so grateful to have been included in your travel log. What wonderful adventures you having. Nancy,we do miss your wonderful smile. Please let me know when you plan a trip to The Ranch! Thanks for your kind words, Ann. We’re so glad to hear from you! What an interesting story! I feel like I’m experiencing all of the same foods and flavors. It sounds like every day is a new adventure.